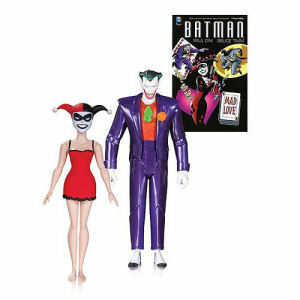 We have Just Sold out of Batman The Animated Series Mad Love Joker and Harley Quinn 2nd Edition Action Figure 2-Pack. Not to Worry! Fill in the Notify me When Available and you will be the first in line for our restock of Batman The Animated Series Mad Love Joker and Harley Quinn 2nd Edition Action Figure 2-Pack !! From the Batman The Animated Series collection by DC Collectibles. Batman The Animated Series Mad Love Joker and Harley Quinn 2nd Edition Action Figure 2-Pack. Harley Quinn measures approximately 5.5 inches tall and Joker stands about 6 inches tall. Ages 14 and up.